Apex Dynamics is a worldwide leader in manufacturing high quality of low backlash planetary and spiral bevel gearboxes at the best value. Based on 30 year of experience and with a strong orientation to provide the highest level of service. Apex Dynamics Italy Srl is the supplier in Italy and through a worldwide network, which consist of 30 Apex agents in 24 countries, the availability and deliveries of product is guaranteed worldwide. We offer our experience to choose the gearbox for your application. We have a very wide product range of gearboxes, which can be mounted on almost all servomotors and are geometrically interchangeable with most gearboxes of other manufacturers. Through continued research and development along with high volume production and unsurpassed technology, Apex Dynamics is always ahead of innovations and follows your requirements and market developments closely. On our website, we will provide a very practical design tool to help you through the selection process. The Apex product range consists of over 9000 different sizes and gear ratios to choose from it. The modern production facility of Apex Dynamics Inc. in Taiwan has a floor area of over 70,000 square meter and a production capacity of 50,000 units per month. So whatever your requirements we are sure to be able to fulfil them with competitive prices and prompt delivery. 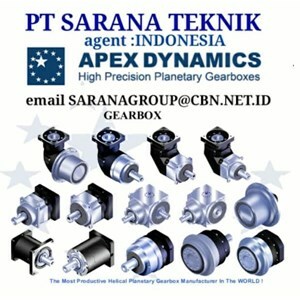 High Precision Planetary Gearboxes adalah salah satu jenis Gearbox Motor yang digunakan sebagai komponen peningkatan kecepatan, pengurangan kecepatan, perubahan arah, netral dan direct drive. 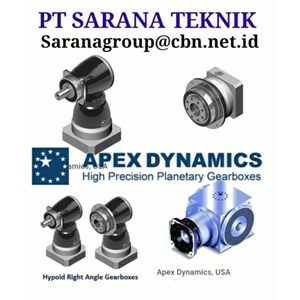 Gear set juga dapat menyediakan variasi kecepatan disetiap tingkatan operasi, dengan pengecualian netral dan direct drive. Right Angle Planetary Gearboxes adalah salah satu jenis Planetary Gear dengan roda gigi sudut. Produk ini dapat dengan mudah dikombinasikan dengan berbagai elemen penggerak seperti pulley, kopling atau gandar linear. Flens masukan dari gearbox planet dengan poros output secara individual disesuaikan dengan motor Anda. ADR - Series High Precision Planetary adalah salah satu jenis Planetary Gear yang memiliki input siku 90° melalui spiral bevel gear. Ini fitur yang sangat singkat, kompatibilitas penuh ke motor manapun. A High Torque, Low backlash COMPACT Helical, One Piece Planetary Cage Design Memberikan Desain Flange Berputar Stiffest dan Paling Akurat di Pasar Saat Ini. Akurasi Superior, Ketahanan Torsi, Kapasitas Beban Momen.